Working more could ultimately mean thousands of dollars less for you under a quirk in the new health-care law going into effect this fall. This could prompt some people to cut back on their hours to avoid losing money….an individual or family whose annual income surpasses maximums set by the federal government—if only by $1—will totally lose subsidies available to buy health insurance under the Affordable Care Act. 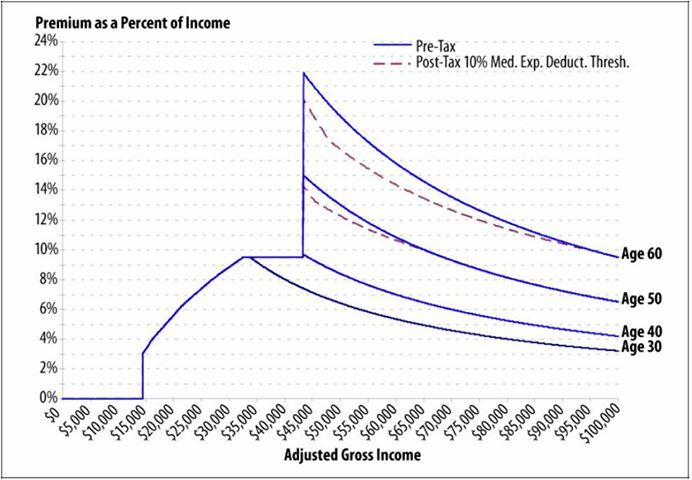 Consider the following chart, showing the guidelines for premiums as a percentage of incomes projected in 2014. …A couple in Ohio, both age 50, would be eligible for subsidies worth $3,452 to purchase a so-called silver insurance plan—a moderately priced level of benefits under the ACA’s scheme—that costs $9,346 annually if they made up to $62,040 per year. But if they made just $1 more than that, they would lose the subsidy…the couple then would have to earn at least $65,492 to make up for the lost subsidy. Under the above scenario, earning $1 more in income cost the couple $3,452 in subsides. The savvy citizen will take heed of this potential pitfall, weighing the costs of losing the subsidy against the potential gain of additional work performed, especially in task or contract related fields where one may have more control over the jobs one takes. This issue will also affect parents of small children deciding whether or not to re-enter the workforce. Combined with the cost of childcare the preference to have more time for the children, and the potential to move into a higher tax bracket, among other issues, this loss of subsidy may cause couples to remain a single-income home rather than both parents returning to work shortly after their child’s birth. When considering that next raise or the extra consulting job, remember to take into account where your new yearly income level will fall in relation to the subsidy cliff. Surprisingly enough under Obamacare, you may very well be better off declining. *Further information, including additional helpful Obamacare resources, can be found here.